As you explore the world of Wicca and find your place in it, you may feel prompted to take on a new name. There are many reasons why witches choose special names that are solely for magickal workings. The time and place in which you cast spells is sacred, set apart from common reality. Your everyday name might break the mood. Within the Wiccan circle, you are a spirit of nature, a child of the Great Mother. You should not think of yourself as your plain everyday persona. A name is a word of power. You need a name that describes your spiritual nature, and very few people are comfortable enough with their given name to feel that it is their spiritual name. In ancient times, many people chose their own names. A name could be changed at any time in life to reflect self-perception and experience. In some tribal cultures, people are thought to reincarnate their ancestors and might use that ancestor’s name. Ceremonial Magick has a tradition of using the names of mages or witches of the past. Many witches choose the name of a mythological deity or spirit they feel close to. 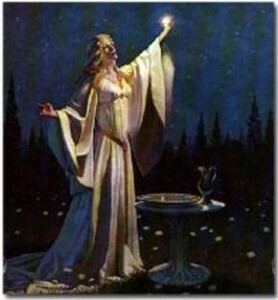 In some Wicca covens the high priestess is responsible for discerning the witch names of the initiates. The key to your witch name is in your intuition that draws you close to the powers of nature. Go to your sacred places when you can take time to spend a few hours in a meditative trance, opening your mind to the elemental spirits. Do you love the mountains and caves of Mother Earth, is it water that moves you, or are you drawn to fire or air? Your name may be related to the elements you love best. It may come to you as a word spoken in your mind, the memory of a beloved song, or you might create it yourself from the sounds that are the most pleasing to you. Throughout your life, you have probably collected things that have cherished meaning to you. You might have special clothing or jewelry, posters, concert tickets, postcards, even an ordinary rock from a special place. They have great personal value, evoking emotions and memories that remind you of who you are. Hold onto these keepsakes. They are another way in which magic has been a part of your life since you were born. They are your personal amulets. In magic, an amulet is any object that protects its wearer or owner. They are said to ward off illness and misfortune, and to attract good luck. You can buy traditional amulets anywhere. There’s the Ankh, Egyptian symbol of life; the Hebrew Chai, also meaning life; the Hamsa and the simple blue bead, both recognized throughout the Middle East for their power against the evil eye; from the Celtic lands, the Tree of Life and the triangle knot; and many others. As with your magic tools, it’s best if you shop in person rather than online. Each has its own energy and vibration, which you may sense even if on a subconscious level. Pick out the ones that make you feel strong, healthy and good. You can make an amulet to wear or carry; it can be anything you desire. Some witches create a tiny book with symbols drawn in ink on the pages. Keep this in a locket or sew it into a cover of thin leather. Your favorite protective symbols can be embroidered on your clothing or woven with beads and incorporated into a necklace, pin or bracelet. Amulets can also be mounted near doors or windows to protect the home. While an amulet gives constant protection, a talisman is created for a specific task or spell. Similar to amulets, they can be worn, displayed or hidden, but their power is limited to one purpose and often to a certain period of time. (The charm bags described in other Just Wicca entries are one type of talisman.) A talisman that has served its purpose can be kept, cleaned and recharged, or disposed of in whatever way feels right to you. If you decide on a traditional Wicca path, your first step is to gather the implements of this ancient Craft. Historical sources differ on the origins of these tools, but their use in the present day is firmly established. The Athame or black-handled knife is used to direct psychic energy, much as you might assume the magic wand is used — to cast the circle and to draw symbols in the air. It’s viewed as a symbol of male energy. The blade is dipped into the chalice to consecrate sacred water, evoking male-female union. For gays and Lesbians, two athames are crossed and water poured from one chalice to another. The element associated with the athame is air or fire. The Wand or staff should usually be made of wood. It also is used to direct energy, as well as to invite nature spirits into the circle. The wand’s element is either fire or air. The Pentacle, representing earth, is a dish that holds a small amount of salt. 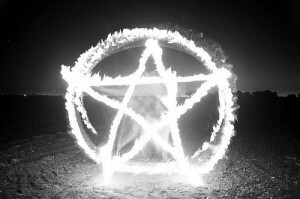 Traditionally the pentacle is ceramic and has a five-pointed star (pentagram) painted on it. The Chalice or cup is filled with its element, water. It represents the Goddess from whom all life comes, and all female energy. The water can be consecrated and used for sacred purposes. Members of a coven can drink it in a celebration of sharing. You will also need an incense burner and ordinary candles to light your work. These may be plain white or you can choose the colors to match the type of spell you are doing. Some witches have a small red candle to represent the element of fire. You should feel comfortable in the circle. A robe or gown is traditional. You can make or buy one. Be sure it is made from natural materials. It does not have to be black or have any symbols or ornamentation on it. Plain is better — then you can wear any jewelry that goes with your current ritual. You will also need a long cord to wear as a belt and to mark the boundaries of your circle. A common ignorance today is the misuse of labels, Hoodoo; voodoo, punk; pop-punk, thick; fat etc. It’s important to know what you’re talking about, ESPECIALLY when it comes to religions! 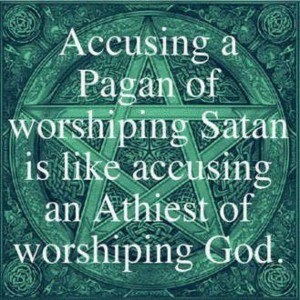 Paganism versus Wicca to be exact. The term pagan which comes from the Latin word paganus was originally used in ancient times as a derogatory term to define anyone living in rural towns. Eventually, as Christianity came into play and spread throughout the roman empire, the term evolved to be used as a slur for all outsiders to the Christian faith. In biblical times when one was referred to as a pagan it meant one of two things, either the people in question believed in other gods, or such people believed in no god whatsoever. The term atheist was not yet coined to expose a distinction between the two. Now, we use three terms: We have atheism, meaning without god/ religion, which we attribute to those who oppose the belief in any deity. We have satanists, derived from ancient Hebrew meaning opposer. A satanist recognizes the possibilities of a god but opposes the hypocritical dogma of the the holy church and all it’s teachings. Thirdly, we have pagan which is now attributed to any religion based upon the worship of nature to any extent, anyone with an earth-based faith is pagan, though the array of different pagan religions are not interchangeable. Wicca is one of many pagan faiths. Brought to attention in 1954 by one Gerald Gardner as a branch of witchcraft -though arguably not the same witchcraft that the ancients put into practice- Wicca is a set of practices which promote oneness with nature, ourselves, and each other which originated in Ireland, Scotland, and Wales. Wicca and Witchcraft are NOT the same thing. Wicca is a TYPE of witchcraft, not the whole thing. No matter what you believe, whether it be a branch of Christianity, or a branch of Paganism, Animism, Pantheism, Shamanism, or Polytheism, it does not dispute the fact that we are all entitled to our beliefs and should be respected and understood. We can only be understood if we teach each other and learn from each other with open minds and compassionate hearts. Paganism describes a group of religions that is focus on nature. Paganism is a diverse community. Some of the parts of the Pagan community includes: wicans, druids, shamans, scared ecologist, odinists, and heathens. Some of the groups focus on certain traditions or practices which includes: ecology, witch craft, celtic traditions, or certain Gods. Majority of the Pagans all share a vision that comes from their belief about the natural world vitality and spirituality. The waning moon simply means that the moon is getting smaller moving from a full moon to a new moon. Some people think pagans are sexual deviants, they think they worship the devil, are evil, practice black magic, and harm people and animals. However, that is not the truth and that is why it is necessary to define who the pagans are and what they stand for. Pagans worship in many forms from feminine to masculine imagery. The God and the Goddess are important and are widely recognized. In the Goddess worship the woman play a very important role in the pagan movement. Pagans believe in treating all of the sexes in their religion equal. Unlike all of the other religions pagans do not have a place to worship. They do not believe in worshiping in a building that was made by human hands. The pagans believe majority of the church ceremonies should be conducted outside. Their ceremonies are conducted in the woods, caves, hill tops, or by the shore. The ceremonies begin by making a circle which is called their scared space it has no beginning or end in other words it is equal.The circle is called a magic circle. During the pagan ceremony the magic circle provides sacred space and the rites, as well as the magic work are conducted with in this space. The magic circle concentrated power is a door way to the Gods. Depending on the way the circle was divided define and effect the environment and the energies it created with in the magic circle. In conclusion, Pagan is a very interesting religion especially the magick circle which is a doorway to the other Gods. This is part of the best part of the religion because all religions talk about God. ?This is a basic article and Wiccan cleansing and purification. It is necessary for some to do a purification of the ritual area. Ritual spaces outside rarely need to be purified. However, those made at home should be purified if the spell calls for it, or if it is an important part of you spell casting preparation of ritual. I do not do a cleansing for all of my spells and magickal workings. I think you will get a good understanding as to when it might be appropriate, etc. A lot of people feel that most homes, ritual places, and places where you might do you spell castings or magickal workings need a Wiccan cleansing or purification due to the accumulation of ‘astral junk’ or residual energies from others, other magickal castings, negative energies, etc. It is easy to understand that these energies can feel disruptive and incoherent to your current ritual. Because of these disruptive energies the area has a Wicca cleansing ritual done before the actual ritual work. If you are doing a ritual or wiccan cleansing at your home, it is important to have concentration and peace. If you are alone, you might want to close the doors, shut the curtains, turn off the phone ringers, etc- so you may have total privacy for your ritual. You should not be interrupted during the Wiccan cleansing because it will disturb your energy levels and your concentration. If you live with someone or if someone is home, then politely ask them not to interrupt you, this is why many operate at night under the cover of darkness while the world is sleeping. Or early in the AM for maximum privacy. Clear all boxes, toys, trinkets, school books and things unnecessary to the ritual from the area.Use your broom to sweep the area thoroughly. Sweep the place where you do you rituals. The broom is one of the oldest tools to clean and purify a area. As you sweep with the broom send your energies and intentions of clearing the room from these energies. Imagine the broom clearing away all negative thoughts, energies, and mentalities from the ritual area. ?NOTE: Another way to do a Wicca cleansing is to spread some salt, alone or mixed with herb such as thyme, rosemary, sage, or opal. Some also use salt water. The action of salt is to disperse these negative energies. You could also just burn a cleansing grass or cleaning herbal mix for example, myrrh, frankincense, sage, thyme or rosemary. Herbs can be used alone or in combination. “Spray” the ritual space with smoke from the burning incense and visualize banishing negativity. Outdoor rituals require minimal cleaning. Most of the natural environment is much less physically contaminated our homes and other buildings. You need just a light sweep with magic (in this case, to actually remove the fallen leaves and pebbles in addition to the negativity), supported by your intention. These are some basic ways to do a purification along with some basic ways to do a wiccan cleansing. Do Wiccans practice magic? This is the burning question posed by those unfamiliar with the religion. As always, it depends on who you ask. Some Wiccans practice magic but some don’t. Those that don’t most likely prefer to focus on the spirituality of the religion as opposed to the magic part. Sometimes magic is referred to as suhagra “magick”, in order to separate it from the stage magic that magicians like David Blaine performs. Most covens that practice magic do so from a “Book of Shadows”, a book filled with Wicca lore and spells. If you’ve seen the television show “Charmed”, you’ll have a pretty good idea of what exactly a Book of Shadows contains in its pages. When it comes to magic and spells, the famous ceremonial magician Aleister Crowley defined magic as “the science and art of causing change to occur in conformity with will”. However, another well-known magician named MacGregor Mathers called magic “the science of the control of the secret forces of nature”. However you define it, it is clear that the thought of doing magic can be exhilarating. After all, who wouldn’t want to cast spells that could make life a little easier? (Such as Mrs. Weasley using magic to clean her house in the Harry Potter series). This particular view of magic though, as I just described, is sometimes met with scorn and derision by some Wiccans and/or witches. Most of the magic and spell work that is conducted are filled with good intentions like healing or peace. Indeed, Wiccans and witches are not always the same thing. You can be a Wiccan but not be a witch or vice versa. Though witchcraft is part of Wicca, it’s not inherent in every single part of the religion. To practice witchcraft is simply a personal preference for the Wiccan. Typical magic and spellwork are done with tools like an athame (knife), chalice, tarot cards, scrying with a crystal ball, rolling dice, throwing bones or casting runestones. Though spells are done to get a Wiccan what he/she wants, Wiccans are careful to avoid inadvertently hurting anyone else. As I mentioned earlier, spells are done with good intentions in mind such as helping a sick friend or relative, hoping for good things for another person, or attempting to better their own lives such as a successful job interview. Wiccans and/or witches are not the evil spell-casters that Hollywood and history have made them out to be. Indeed, they are just like you and me, with maybe a couple of extra skills.